Pleated to sett. A rush order for a very happy client! We realized that I had made every kilt at our table. What fun! 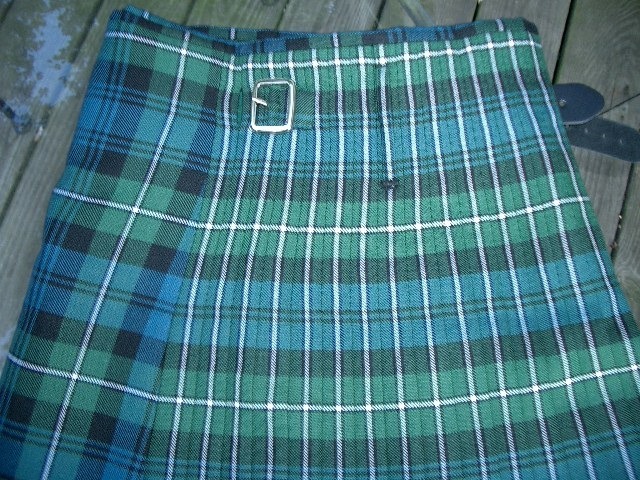 This kilt was made with the customer's own fabric. While not a tartan in the strictest sense, it makes a beautiful kilt. The colors are in a tradiltional Scottish colorway, usually called "weathered", where the blues turn to slate, the greens to khaki or olive, and the reds become a soft cranberry. Beautiful! Clan Armstrong. Pleated to sett. Modern colors. Cameron of Erracht tartan in modern colors, pleated to stripe. Brian tries on his new kilt, Clan Smith tartan. Pleated to sett. Clan MacBean kilts in ancient colors. Although the colors differ slightly, they are the same tartan and color system; the fabric came from different weavers in Scotland. U. S. Army tartan, modern colors, pleated to stripe as is proper for a military kilt. Clan Campbell muted colors, pleated to the blue field. 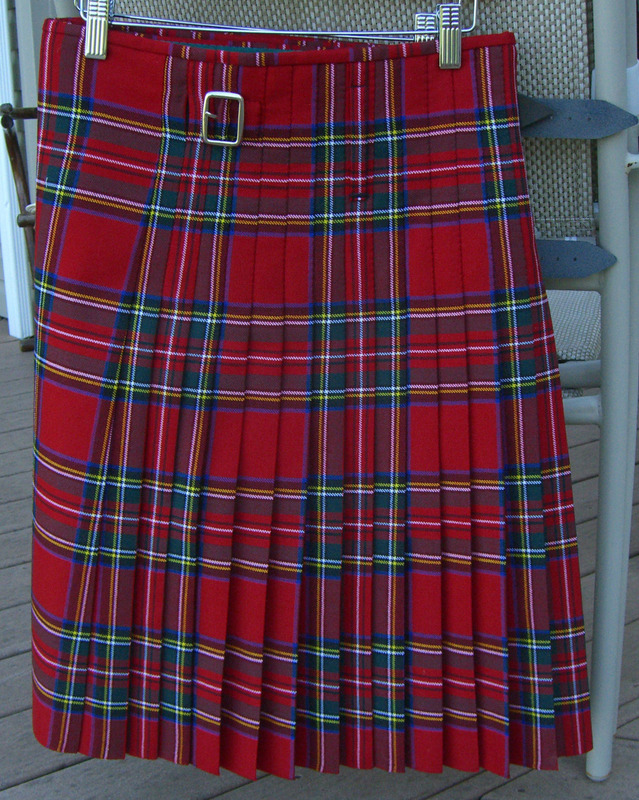 Royal Stewart, modern red colors, pleated to sett. Usually designated for pipe bands. Clan Wilson tartan, ancient colors, pleated to the alternating pivot point. Clan Lamont tartan, ancient colors, pleated to stripe. The inside of a kilt, showing the lining. Clan MacNeil of Barra, ancient colors, pleated to stripe. Clan MacEwan ancient colors, pleated to sett. Clan Wallace, ancient colors, pleated to stripe. County Cork, an Irish tartan. Muted colors, pleated to sett. Boy Scout tartan, based on MacLaren. Modern colors, to stripe. Clan Buchanan, ancient colors, pleated to sett. This kilt was made for a tiny tot for a wedding. About 11" long with 3" of hem for future growth. Clan Scott. 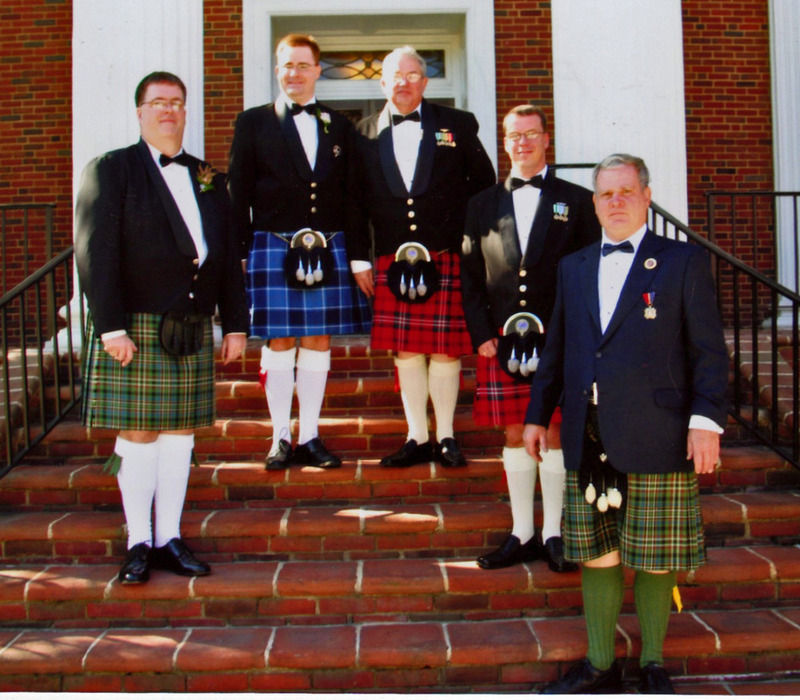 Two kilts in modern Red Scott, two kilts in ancient Green Scott, one kilt in US Navy tartan. An interesting view of the inside of a kilt in work. 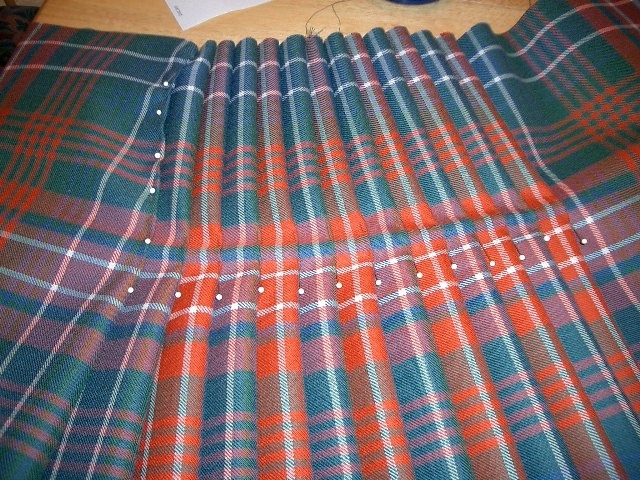 The upper part of the pleats is graded away to eliminate bulk, so the kilt will fit smoothly to the body. The raw edges will be covered with interfacing for stability and then lined. Clan Smith tartan in the modern colors. This client chose to have his kilt pleated to stripe. Having a choice of "centers"; he chose the white in the burgundy for the pleat face. It is a beautiful kilt. This kilt is actually pleated to stripe. It is such a gorgeous tartan, I had to show the front panel so the sett is easily seen (it was pleated to stripe). Weir tartan, modern colors. It may look purple on your monitor, but it is truly a deep ultramarine blue. Lovely! Unusual in the US, I enjoyed making this special kilt. This is a very soft wool. It's fun to make something different. A rare tartan, my client found it. I didn't know it was available! He chose to have it pleated to the white overstripe, which is an excellent choice. Very purple. Modern colors. Pleated to sett. I like how this photo shows the subtle shaping to fit a body. I made the kilt half of this business suit. Sorry... I don't make jackets. Now there is a photo of the whole outfit! Truly elegant. I am honored to be a part of this quietly spectacular outfit! Thank you AH. 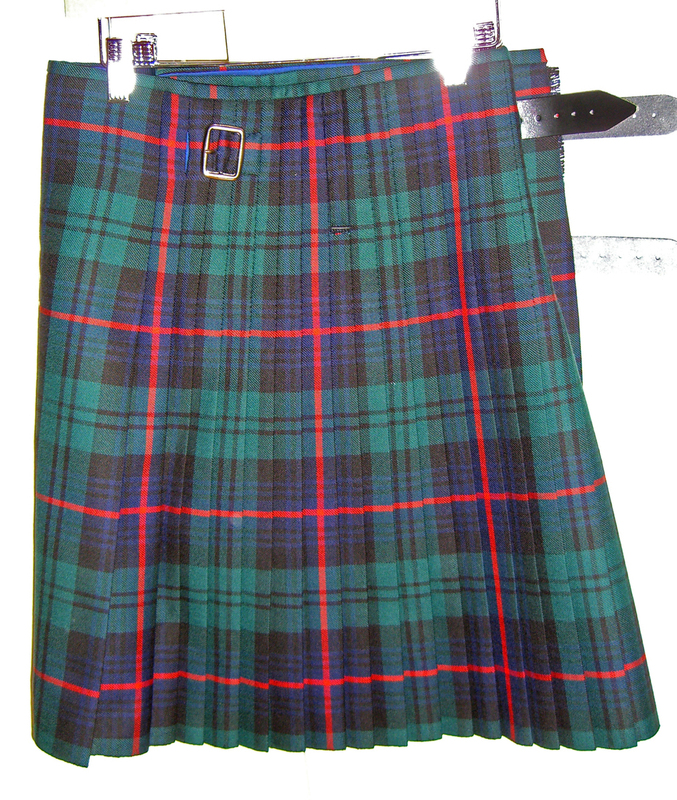 The next kilt for the same person. I have not seen the jacket and vest yet. Can't wait, this one looks even more elegant. 100% wool, pleated to stripe, of course!